Kerala - A Tourist State - Ghumakkar - Inspiring travel experiences. It was a week-long escape to Kerala- God’s own country. 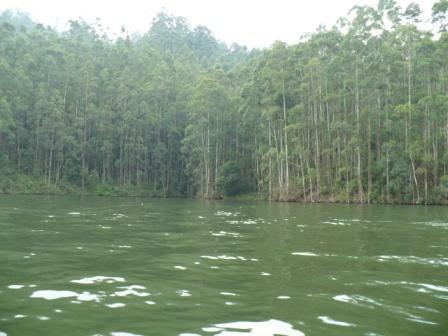 The green and cosy-lazy Kochin, lush beauty of Munnar, the expanse of Periyar and finally a trip along the waterways. Nothing more we could ask for. Yes, indeed Kerala is beautiful with loads of greenery and waterfalls and winding hill roads. The boat ride on Periyar’s green-blue water watching the dark jungle on the banks and avoiding the quite a few lonely tree trunks jutting out of water is an experience in itself. The voyage on backwaters, equally relaxing where we watched life in full form on both the banks laced with birds flying, sun setting and trees reflecting in the water. All in all great holiday experience but somehow it failed to touch my heart. It could be excess hype created for the God’s own country or over-commercialization of every activity. Maybe it was too tourist oriented or maybe it was too rehearsed. I thought that Kerala has overdone their tourism avatar. And I guess that will be the fate of most of India’s tourism-oriented states. More a place becomes a tourist attraction, it fast loses its raw appeal. It also loses its purpose for being an attraction since now it gets crowded with so many other ’attractions’ e.g. shops, eateries specially put in to appease a special someone called ‘tourist’. The Echo point of Mattuputy lake in Munnar was a blatant reminder of the fact that we go as tourists and tourism mean shopping and eating. It would have been such a serene place with green silky waters draped on earth and wall of tall trees and hills bordering the vast lake. However, it was nothing but a shop hive with bhaji and chai smells wafting all around! I understand that it is a commercial decision to put entry fees for jungle treks, temples and monuments, facilitate boat rides at a price on lakes and take tolls to ride smoothly on a thickly forested road. All in all enhancing tourism seems to be all about creating more ‘enjoyment’ opportunities from which the state can generate money. And what sort of enjoyment it is really! A scripted ride on the elephant through plantations on a patch of road traversed by the elephant umpteen times in a day or a walk through the quarter of an acre of spice plants with a guide who is better off speaking in his mother tongue. Since we heavily borrow all our lifestyle ideas from the influential West, it is no wonder that the implementation of tourism is an equally imported and copied feature of modern India. Tourism in all developed countries is a matter of enjoyment, relaxation and more often entertainment. Hence a great natural wonder is often reduced to a two-hour tour at a price. And many times trivial and mundane spot is also elevated and hyped to a level of ‘great attraction’ which can fool you and ultimately leave you dissatisfied. The emphasis is on the ‘paying’ tourist and not on the spot. Well some of us definitely enjoy this ‘tourism’ but some of us want to run away from it. Having access to mineral water on a hilltop is good, but more important is access to written material about the place, the history, the geography. Making facilities of food and relaxation are wanted but keep the sanctity of the place, we do not want to hear radio tunes in pristine lake forest. In an attempt to attract the ‘paying’,’ urban’ tourist we come up with some ideas so flawed and so dangerous. The lovely ‘Kettuvelam’, the backwater barge is an important fixture in Kerala tourism. 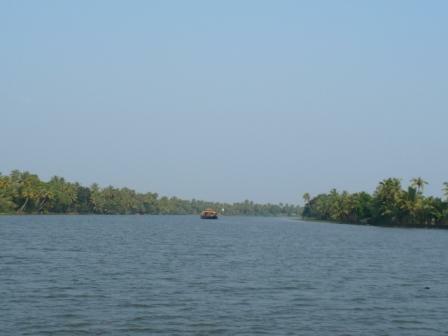 The boat ride is an experience no doubt when it takes you in alleys of backwaters. But then in the night, for our air-conditioned stay on the barge, the power generator is roaring away spoiling the real calm we came to experience. What is the point in offering people to stay on a moored barge and polluting the surroundings with smoke and noise? I believe it would be the same thing for ‘Deluxe’ Shikara stay in Kashmir. 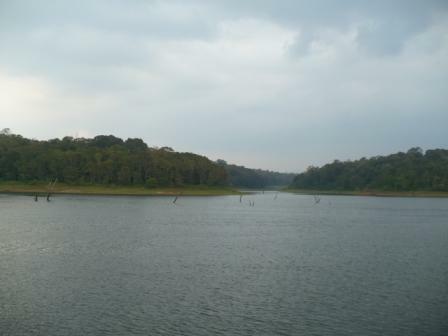 The experienced folks can tell… The same goes for a boat ride on Periyar Lake. It is a boat party crowded with people in all shapes and sizes, squealing, talking, laughing, eating and out to see the ‘wildlife’. No wonder the ‘wildlife’ hides in the deep confines of the forest. We saw a silhouette of a couple of elephants grazing on top of a distant hill and that was the reason to rejoice. And if I remember, it was a reason for the toppling of a certain barge in the same lake as people rushed to one side to take photos, a huge tragedy. Finally, what is tourism and what does a tourist want? Many amongst us want to have the same city life of comfort, movies, shops, rich food albeit in a different setting for a few days. But there are few who are learners before they are tourists, who want to understand the place and its ethos in a completely natural setting. Maybe it is best for such a tourist to visit a museum and gaze at a sculpture and recreate the surrounding by imagination and ‘enjoy’ the experience. Looks like Kerala couldnt live up to ur expectations thats why so Anger. Most of us go to holidays so as to move aways from our daily life and for relaxing. Ur Post is also messed up, there are pictures but dont know what they are doing here because ur post and them have nothing in common. While pictures dont showcases ur thoughts about Kerala, i guess there are many posts in Ghumakkar which will help u in chosing ur right destination next time. Huh..I was planning a trip to kerala this Nov but Manisha’s post is forcing me to give it a second thought or a little more research..It was good to know information though. Thanks Manisha..
Did you buy a package tour or planned it on your own. It seems that modern tourism is spoiling the raw beauty of God’s own country, but I am sure our ghumakkars can find a good solution to this problem. Around 7-8 months back I had been to Kochi. Thanks for refreshing the memories. 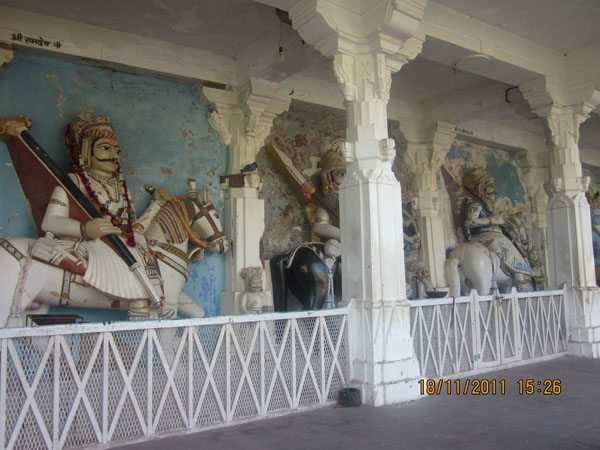 I know this is not exactly travel post but then what better place than Ghumakkar to share your travel thoughts? I am not angry at Kerala, just frustrated at irresponsible tourism. The pictures in the post are supposed to showcase beauty of Kerala where as the post is about the commercial and touristy attitude. Beautiful thoughts Manisha and credits to you for this brave article as you have written that reflects us so well. I agree with you that ghumakkar is a perfect place to share one’s opinion, experiences good or bad. It may draw attention of some and may change the attitude. Though your comment is in general about touristic places of Kerala, in Thekkady, I too didn’t felt any possibility of spotting any wild life on that boat trip. It was a waste of time. Sameer, you may rethink but please do remember that we all are of different types and hence we may come back with different kind of experiences. More beautiful a place, more there is danger that it will be picked up to be a tourist promotion thing, and consequently, the very reasons that made it important will be destroyed. Most persons coming for such trips are not bothered, as long as you can guarantee entertainment, food, AC, etc. to which they are accustomed. They are not really interested in “learning”. The “learning” tourists have to look for things off the beaten track, that have not yet been discovered. My backwaters half-day tour in first week of April, to a place near Cochin, was not bad and the guide knew his stuff and seemed to love it. But it was away from the better known places in Alleppy or Kumarkom, etc. Your post reminds me of my first trip on a tourist bus to Corbett park many years ago with a dozen people and two non-English speaking guides. We flew through the winding roads to Dhikala, saw a few spotted deer running, startled by the noisy diesel engine. On my next trip, I chose to be alone in a hired jeep with an English speaking guide, and this time I saw and photographed a variety of animals including Langurs, Mugger, Sambar, thousands of spotted deer, a jackal, peacocks, Muntjac, herds of elephants and a leopard in addition to hundreds of species of birds including the crested hawk and the fishing eagle. My nights were spent far away from the TV, radio and phones and woke up listening to the songs of birds and an occasional cry of the barking deer. In Kerala too, my visits were changed to personalized adventure trekking. From Kottayam, I went to the northern Malabar and visited the Silent Valley and Parambikulam National Parks, photographing a variety of animals; to the east to Munnar and Eravikulam National Park surrounded by the enchanted tea plantations stretching thousands of hecters and thrilled to watch the elusive and rare Nilgiri Tahrs. Yes, I too have been to Periyar tiger reserve and photographed herds of elephants, Sambar, spotted deer, water buffalo, rhesus monkeys and Nilgiri langurs, wild pigs, giant Malabar squirrel as well as a variety of birds. A night spent on a small hut built on a tall tree in the midst of the jungle , and a day trek through the thick forest were memorable. In East Africa too, I joined a tourist group to see the National Parks first, and later I chose to visit them in private vehicles where I decided where to go, when to stop and what to see. Although it costs a little more, the results were astonishing. Watching and photographing the biggest tusker (elephant) under the shadow of Mount Kenya in the company of a world famous author and an expert naturalist was a great privilege, and far better than rushing through the plains of Africa in a crowded bus packed with noisy tourists! It is all boil down to how you choose to see it that makes the difference. My nights in Naini Tal were disturbing with very loud music by a group hired by the Claridges, and once their generator failed to start when the AC went out due to a power failure. But, comparing to the pleasure of witnessing a rich wildlife each time had compensated all those small shortcomings. I was there to learn and enjoy the sights and did not diffuse my enthusiasm with small matters – a way of modern life you might say. I will visit many parts of India again. Everybody, Thanks again for your comments. Definitely inspired by your stories of finding your own way to connect with the nature. Haven’t been to Kerala. Would want to go, by road and mostly surrounded by my own chatter crowd (a growing kid, a strongly opinionated and argumentative man and a non-conforming woman). You are so right Manisha. Over time, I have learned to build peace with it and tried to find my own way or to latch on to other folks who seemed like like-minded ones. When I get into a situation like this now, I guess I am now able to almost detach myself from the right (anyway, who decides whats right/wrong) and at times rather get involved in the travel-harakari. I haven’t been to Kerala, but really enjoyed my visit to Sri Lanka earlier this year. Folks who have been to both places tell me that there are a lot of similarities, but few differences: Sri Lanka is a lot cleaner and maybe not quite as crowded as Kerala. You should check it out for sure. As you describe though, modern luxuries have made there way to Sri Lanka tourist spots as well (I for one like that :) ). I completely agree with you Manisha. I am the kind of person who enjoys being in the wild more than anything else. 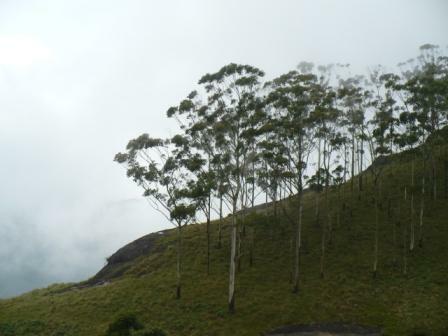 My visit to Munnar two years ago put all my dreams of God’s Own Country to rest. 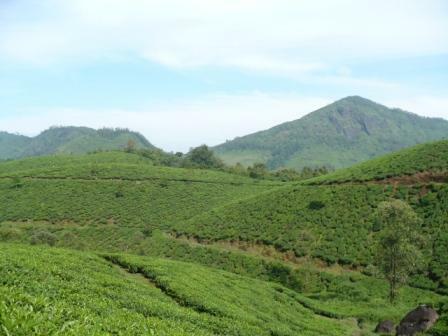 I liked the Tea Plantations alright but I am sure the forests that occupied these lands before all this happened would’ve been out of this world. Nandan, I liked the word ‘Travel Harakiri’… very apt. Amit, I like modern luxuries myself, but one should not come up with solutions which provide comfort at the cost of environment. Pravin, I don�t know about MacD, but yes you do find Lays and Pepsi at the remotest place in Himalaya. But then that is a topic for another discussion. Neelima, your comments about sustainable tourism are just perfect, that is what I wanted to say. Though Periyar wildlife sanctuary at Thekkady is a tiger reserve, it’s really hard to see them. But some animals can surely be seen. Eventually, nature is the only reason to go there. If you would like to enjoy the wild life and natural beauty of kerala, go to lesser known places…. hii Manisha , nyc post…I too visited Kerala few yrs back…It is a beautiful place no doubt…I personaly liked Kovlam Beach very much…!!! Greetings. To start with I need to say that I actually like your blog, just identified it last week but I have been following it sometimes since then. The tourism of Kerala is presently concentrated in the southand central part of the state.Infact the northern part of Kerala is untouched by tourism overflow.There are many beautiful places like Wayanad ,kozhikode,Kannur dat havent lost its charm and the rich culture.The whole North kerala was under British rule till post independence.U can find traces of it and the northern kerala is called as MALABAR.The muslim culture together with traditional Hindu culture is flourishd here.The food too have its own speciality.”Thalassery Biriyani” is infact tastier than hyderabadi biriyani..Plse do consider North kerala next time. Interesting thoughts Manisha. Maybe you did not enjoy the experience as you did the regular touristy circuit. The beauty of Kerala is that if one ventures just slightly off the beaten track, there is much to enjoy in solitude around these same places. For example at Madupetty lake, you could have cut to the lake shore a short distance away from the main tourist area and enjoyed the place in your own company. Ditto all the tea growing areas, take a walk through the plantations away from the crowds at any unfenced area and so forth. In Periyar, the purpose of the boat ride is to enable people who otherwise would not be able to, to see wildlife at reasonable close quarters. Usually on the first boat ride there are terrific sightings of elephants, sambars, bisons and boars. The guided treks and whole day forest programmes there are pretty good without any noise, litter or commercial tourism signs. You can walk in peaceful solitude in plantation areas in Idukki district near Puliyanmedu etc. On your next trip, do venture off the beaten track wherever it be, Im sure you will enjoy it. Your views from 2010 are more valid today. I believe the members who were not able to identify the scuff yesterday would totally agree to it today . Can’t agree with you more, Manishji….Nowadays, people(including myself) in the name of tourism, want to have all the comforts of cities when we visit natural reserves, hill stations and remote forests. It is a sad reality of our times. Blueish water and Greenish hillside….and the Nature; Just wow! Certainly, another great destination to get myself off the crowd. Thanks for sharing. Thank you for sharing a wonderful Information. The grandeur of the city is difficult to baroque in words, the wide roads, the glimpse of the unique architecture, the hospitality of people; everything is entrancing to transport one back to the ancient Rajput era. The popular song, “Kesaria balam padharo mare desh….” epitomizes the true spirit of the people of Jodhpur who inspite of being proud of their lineage and cultural heritage welcome everyone to their city with an equal amount of humility and love.